I was longing for a deeper understanding of the feminine, turned off by the maleness of the feminist movement, by the many new age works and countless other women sharing circles and ways to âunleashâ or âdiscover the goddess withinâ. I am fortunate to be surrounded by amazing talented and creative women, so i did find something interesting and inspiring when we would meet organically but more than that i had pretty much dropped the official feminine âworkâ….until i met the Moon Dance. There is something mystical and ancient about women gathering and dancing under the full-moon for four nights in a row, each one with the collective and personal intention…or not…to simply bathe under the beauty of the full-moonâs intense energy, opens up channels. The Moon Dance movement began in the 1990âs in Mexico when the original grandmothers decoded and revived an old ceremony that was left in the pre Colombian Mexica Codex scriptures. It showed women dancing under the moon, praying with tobacco. Together with this information and support from the Sun Dance structure, the first circle was âplantedâ. Today there are circles in North, Central and South America. Led by female elders, the Grandmothers Malinali and Ana Itzpapalotl, held by a central pow wow drum, songs are sung to Creator, to the Moon, the Earth and all the elements to uplift and create a sacred safe circle to heal, to celebrate, to rememberâ¦obsidian pipes are smoked, stories are shared, visions arrive, empowerment and healing happensâ¦ and the mystical gates are opened. In the Moon Dance, the men have a very crucial role, they support the happening from the outside, keeping the central fire always burning, preparing the sweat lodges, serving tea and hot chocolate. It is a very special and rewarding movement for all to be part of and PachaMama has benefited greatly directly and indirectly from this very feminine work. Seven years ago, PachaMama decided to include the men inside the circle and the Moon work became the âDual Danceâ. All of PachaMama camps by the river and participates in the celebration of life under the moon and stars. The children dance and drum and even lead sweat lodges. I am always inspired by the teachings, the beauty and magic that happens in the Moon Dance and Dual Dance. It is an event that unites Male and Female, Humans and Earth, upholding individuals and community and touching oneness between Earth and Sky. 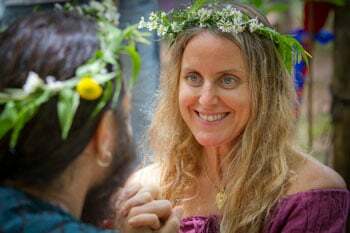 Chandani is one of the founders of PachaMama and the life partner of Tyohar. With her feminine touch, she is at the very heart of many of the different aspects of PachaMama’s community life. Whether working with the ECO department on a daily basis or holding and organizing Red Road happenings such as ceremonies, sweat lodges and the drum for the Dual Dance, her role in creating the unique lifestyle of PachaMama is fundamental. She has also played a key role in the High Vibe movement in PachaMama, envisioning and facilitating a drastic transition to organic, healthy eating in the village. She is also co-leading PachaMama’s “It’s Good for You” workshop.